Out2Gettem Bowfishing Charters is a small locally owned business located in Plaquemines Parish; a short 30 minute drive from New Orleans. A lifelong hobby, has now turned into a full blown charter business. Out2Gettem Bowfishing Charters is licensed and insured with the United States Coast Guard and alongside of Captain Andy who has been doing charters for the past 6 years. Out2Gettem Bowfishing Chartersvhas Genesis brand bows for men, woman and children. Also, bows for the left and right handed fisherman. Out2Gettem Bowfishing Charters specializes in 2 person charters but can accommodate up to 6 people. Charters that may require more than 6 people, will need to call in advance for Out2Gettem to make special accommodations; however, this is not guaranteed. Out2Gettem Bowfishing Charters will launch at dusk and will last 4/5 hours, or less, if each person’s fish limit is shot or accounted for. Out2Gettem Bowfishing Charters will bring you throughout the marshes of Louisiana to shoot redfish, sheepshead, flounder, black drum and gar fish. Captain Andy Schultheis born and raised in Plaquemines Parish, Louisiana has grown up on the water and has been bowfishing for 20+ years. Out2Gettem Bowfishing Charters treats each charter as if you were family and will help you create memories of a life time. We have all the required equipment for bowfishing to make sure you are well-prepared to tear through the water. We treat each customer as if you were family and will help you create memories of a life time. We will bring you throughout the marshes of Louisiana to shoot redfish, sheepshead, flounder, black drum and gar fish just to name a few. We specialize in 2 person charters but can accommodate up to 6 people. 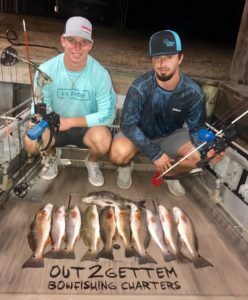 Charters that may require more than 6 people, will need to call in advance for Out2Gettem Bowfishing Charters to make special accommodations; however, this is not guaranteed. Our charters will launch at dusk and will last 4/5 hours, or less, if each person’s fish limit is shot or accounted for. We will bring you throughout the beautiful marshes of Louisiana. It is an experience you will never forget!